Earnshaw’s theorem proves that using only static ferromagnetism it is impossible to stably levitate against gravity, but servomechanisms, the use of diamagnetic materials, super conduction, or systems involving eddy currents permit this to occur. In some cases the lifting force is provided by magnetic levitation, but there is a mechanical support bearing little load that provides stability. This is termed pseudolevitation. Magnetic levitation is used for maglev trains, magnetic bearings and for product display purposes. Earnshaw’s theorem proved conclusively that it is not possible to levitate stably using only static, macroscopic, paramagnetic fields. The forces acting on any paramagnetic object in any combination of gravitational, electrostatic, and magneto static fields will make the object’s position unstable along at least one axis, and can be unstable along all axes. However, several possibilities exist to make levitation viable, for example, the use of electronic stabilization or diamagnetic materials (since relative magnetic permeability is less than one, it can be shown that diamagnetic materials are stable along at least one axis, and can be stable along all axes. Dynamic stability occurs when the levitation system is able to damp out any vibration like motion that may occur. For successful levitation and control of all 6 axes (3 spatial and 3 rotational) a combination of permanent magnets and electromagnets or diamantes or superconductors as well as attractive and repulsive fields can be used. From Earnshaw’s theorem at least one stable axis must be present for the system to levitate successfully, but the other axes can be stabilized using ferromagnetism. The primary ones used in maglev trains are servo-stabilized electromagnetic suspension (EMS), electrodynamics suspension (EDS), and experimentally, Inductrack. If one moves a base made of a very good electrical conductor such as copper, aluminium or silver close to a magnet, an (eddy) current will be induced in the conductor that will oppose the changes in the field and create an opposite field that will repel the magnet (Lenz’s law). 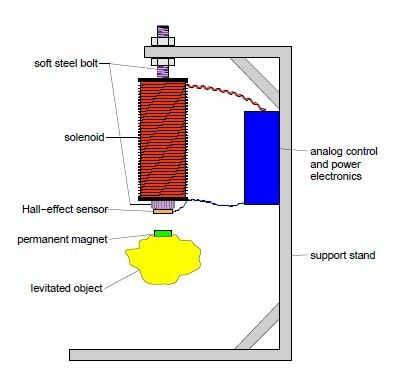 At a sufficiently high rate of movement, a suspended magnet will levitate on the metal, or vice versa with suspended metal. Litz wire made of wire thinner than the skin depth for the frequencies seen by the metal works much more efficiently than solid conductors. An especially technologically-interesting case of this comes when one uses a Halbach array instead of a single pole permanent magnet, as this almost doubles the field strength, which in turn almost doubles the strength of the eddy currents. The net effect is to more than triple the lift force. Using two opposed Halbach arrays increases the field even further. Halbach arrays are also well-suited to magnetic levitation and stabilization of gyroscopes and electric motor and generator spindles.